NASA, China has a moon landing under it’s belt; could this be a sign of a red storm rising? On Dec. 1, China launched the Chang’e-3 lunar probe. It was launched from the Xichang Satellite Launch Center using a Long March-3B rocket. It soft landed on the moon on Dec. 14 in preparation for exploring for natural resources and carrying out geological surveys. It’s only the third country to achieve a soft landing behind the Unites States and the former Soviet Union. 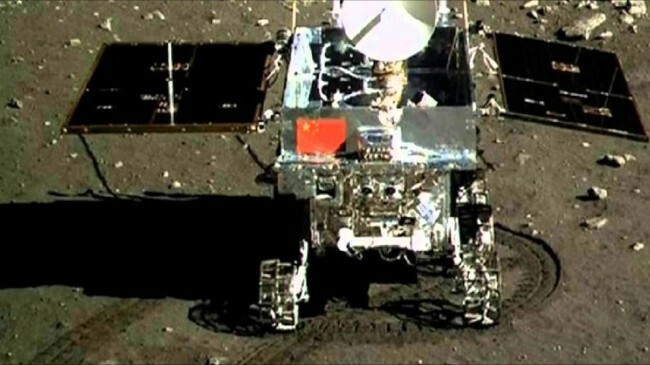 Once the Chang’e-3 landed on the moon it lowered a ramp and Yutu, which means Jade Rabbit, rolled into action. The Jade Rabbit moon rover is set to explore the Bay of Rainbows for the next three months. The Chang’e-3 is the latest part of a Chinese space program that has been very busy of late. In 2007 they launched their Chang’e-1, a moon orbiter. In 2010 they launched the Chang’e-2, another moon orbiter. In June of this year they put three taikonauts in space and docked with an experimental space laboratory. Chang’e-4 is slated for 2017 and will possibly pave the way for the Chinese to put astronauts on the moon. Following that is a proposed large space station, possibly up and running by 2020. They are thinking big, with a future lunar base for taikonauts and even manned missions to Mars. It’s a very impressive show of power, which is intended. It’s also an equally impressive show of technology. With the precision that the Chang’e-3 has shown in the last couple of weeks come questions of how the Chinese might use that technology in the future. NASA and other eyes will be focused on the Jade Rabbit as it explores the lunar landscape. To produce a vehicle that can withstand temperatures of minus 180 degrees and go to sleep and wake up on command from earth requires very sophisticated technology. The Jade Rabbit also has a thermal control system that can maintain the rover during the night which is extremely important considering one lunar night equals 14 days on earth. If that is the kind of technology being developed today, imagine what it will be like in 10, 20, or even 30 years down the road. Apply that same technology to satellites, communications, missiles, anti-missile systems, and other space related technology. Picture how advanced all these systems will become. What China is accomplishing here is very impressive. The Chang’e-3 is much more than a moon landing, it’s showing the world that they should be taken seriously; they’re showing NASA and the world that a red storm is rising. The Americans were last on the moon in 1972; will they return? With their attention firmly on Mars many believe they will not. The Russians are in a rebuilding phase which leaves questions regarding the future of their program. The Europeans want to put a lunar lander on the moon’s south pole in 2018. India launched a spacecraft to Mars this year and wants to put a man on the moon by 2020. Space is becoming quite busy. As for the Chinese, could this be a red storm rising, or just another moon landing? Whichever the case with each successive mission new technology is gleaned and advances are made. Can NASA and the other space superpowers afford to watch from the sidelines? It looks like there could be a space brawl brewing with the Chinese in one corner, the Europeans potentially in another, the Russians in a third, and the Americans rounding out the ring. Astronauts, cosmonauts, taikonauts, put your helmets on, shake hands, and may the friendliest nation win. 12 Responses to "NASA Beware Red Storm Rising"
You both, are correct in some respect, the answer, if you remember the confrontations between the major country blocks and similar discussions (we now read) before the Second World War and during the last Cold War, while not suggesting at all that a bloody war has to happen to decide who is more or less corrupted, given the way major central banks are easing money supplies to large extend in the short run to fuel “corrupted” operations around the world, which political systems and/or regimes end up on the winning side, for the moment seemed to be somewhat unpredictable …. do we trust political leaders in this brave new world? NASA landed on the moon back in 1965. (non-manned). The Apollo missions landed 6 times on the moon post 1969. And now NASA is looking towards Mars – orders of magnitude more difficult than a manned lunar mission. I believe the Chinese accomplishment is newsworthy but let’s be objective and leave the sensationalism elsewhere. When China is attempting manned missions to Mars, then we’ll have a race on our hands. Until then, China’s results, let’s emphasize that, their results are half a century behind NASA. Again, no disrespect to China’s super achievement but let’s view things realistically. Helium-3… I believe a few years from now it will be clear that a priority of China, Russia and the US is the harvesting of He-3 from lunar soil. Nice letter, as it shows that the importance of space exploration isn’t so much in the destination as it is in the technology developed and problems solved reaching the destination. However, the letter needs to address the president and congress, not NASA. It is a common misconception that NASA chooses what it does. There is no such thing as NASA policy; there is the president’s space policy and it is NASA’s job to implement it. It is then up to congress to provide adequate funding. It’s so very exciting! The US, Europe, India, China, Japan, etc, all spending big bbucks to create new technology and to reduce the cost if existing tech. We’ll ll benefit from this in the end. Look how much we benefited from all the NASA missions, New materials, New tech, etc. BTW, I don’t believe for one second how little India is spending on their space mission. Once again it’s all about the spin! India has less expensive spacecraft for exploring deep space for a number of practical reasons. 1. Their labor rate is much lower. 4. They rely on the American Deep Space Network (at least the Mars mission). This is not in any way to denigrate the Indians. It’s just that these sorts of costs will not remain this low in the future once missions become more complex, they need to support all facets, and they start losing their talent to higher-wage nations. Big government does create big opportunities for corruption, Pete. Anyhow, given that the US had to partner with other nations to afford to build the International Space Station, it will be interesting to see if China can actually fund these programs. I suppose the technology is getting cheaper. Not the least important point, the technology involved in the Mars rovers is far more advanced than China’s moon rover. Actually there is no new technology being gleaned or anything like it by China. The science of allowing a machine to sleep and then wake and then sleep again was developed by the Russians in the 1960s. The technology the Chinese are using is 50 years old, from lift vehicles to the lunar surface vehicle itself. And, if certain publications would consider the economic constraints of gathering raw materials from the moon and ferrying them back to Earth or creating a launching facility to visit other objects in the solar system, the obvious downside is apparent in a moment. One might also consider that the American craft, Opportunity – the Mars rover – has been exploring the red planet since 2004. The intimation in the article that the U.S. and the rest of the world is standing still is absurd. Hopefully China stays on top. They should, they have a much better system in place than the corrupt US. Corrupt the US might be but I have lived in China and the level of corruption (especially in Beijing) makes the US look like a social Utopia.